How to Introduce Yourself at a Furry Convention (When You're Super Shy) - The Art of Marci - Furries! So you’ve decided to try out a furry convention. This advice is not for you people who can bounce into a room, instantly make 5 friends, and get invited to no less than 5 room parties that are going on that night. No, this advice is for those of us who cringe at the very thought of creeping into that room full of strangers, who would rather chew off our own fingers than strike up a conversation, and who are just fine with having a quiet night in to ourselves, thank you very much. Quiet nights in to oneself are lovely. It’s soothing and restful to cozy up to a good book with a hot cup of tea in hand, in the company of the cat (who demands little else of you than that you sit still and occasionally stroke her). But that’s not why you’re here, at this convention. Whether you’ve had to get up the nerve to take the bus across town, or you’ve had to work extra shifts at Walmart to save up for the airfare and hotel, you’ve invested in this expedition, damn it. You’ve risked your sanity, your peace of mind, the good opinion of your parents, and why? Because you want to be around other people who get you, who are into the same things you are, and because it’s different doing it in real life. So don’t waste this opportunity. You don’t want to go home, feeling Meh. Why did I bother? I’ll just lurk some more on the forums. No, you want to feel like you actually had an experience, like you connected with people, maybe even made a friend or two. So how do you get yourself out there? What’s even the first step for a poor, sheltered introvert like yourself? First of all, make some connections before you go. It’s pretty tough to start from zero, so do yourself a favour and reach out from the safety of your computer. Hang out where your peeps are, those who share your particular brand of fandom (because everyone’s got their thing, right?). Find someone who’s sharing (because even introverts can be talkative when they’re typing)—ask them questions. How did you get into this? What do you like best? Any advice for a newbie con-goer? Find out who’s going to the furry convention you’re planning on attending. Make plans (definite plans, not just, “We should totally hang out sometime” pseudo-plans) to meet up at the con. Who knows; maybe they’ll become your new BFF, or a friend of theirs will. Second, ask questions. If you’re in the registration line from hell, chat with the people around you (maybe you can even listen in on their conversations first). 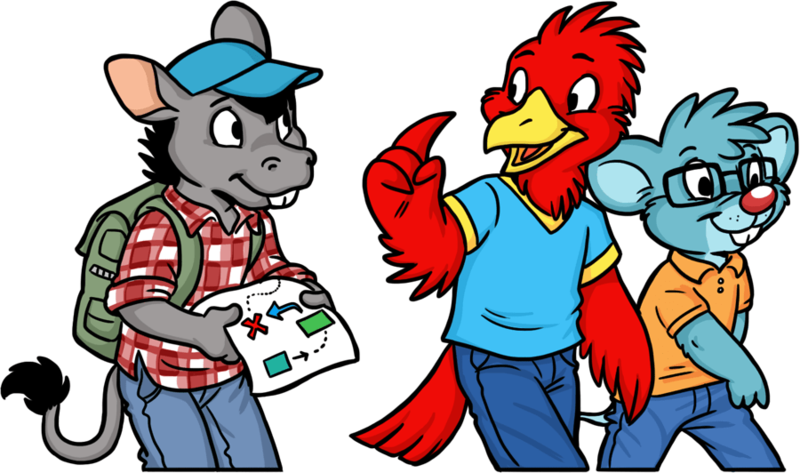 Ask them questions about themselves: Is this your first con, or have you been to this one before? Where are you from? Know any good places to eat around here? Got any advice on panels I should go to? Once you’ve asked them about themselves, share a bit about your own adventures (or misadventures) getting to the con. Your conversation might not result in a dinner invitation, but you’ve put yourself out there. Well done, you! If you want to wrap up the conversation, wish them a terrific time at the con and dig out your phone (to check the convention schedule, not to play Pokemon Go). Third, a picture is worth a thousand words. Furry conventions are very art-based, so get a badge to do the cold introductions for you. If you’re artistically inclined, make a badge with your fursona and fan name (and if you’re not artistic, you can find ten million artists on Furaffinity who would be happy to help you out in exchange for a bit of dough. I’m open for badge commissions myself). Then wear your badge proudly so everyone can see it (it’s kind of useless hiding it under your comfort jacket that you never take off). Everyone else is doing it too, so ask them about their badge: “I love your badge—who’s the artist?” “You’re a fox? I’m a fox!” “That’s such a great name; how did you come up with it?” Everyone loves to talk about themselves, especially the fursona that they took the time to construct. Come on, you do too. Yes, you do. If someone asks about your badge, don’t mumble—offer them your story. It doesn’t have to be a long story, mind you; they don’t need to know about your fursona’s childhood trauma that’s the reason for their career military path and why they have a twitch in their left eye. So now you’ve struck up a conversation, or at least made contact with other humans. You want to immerse yourself in this experience. This is going to require stepping outside of your comfort zone. Hey, you’ve made it this far—why not go in all the way? Go to a panel or two. Drop in at the dance, and actually move your body (sitting in a chair all night doesn’t count, unless you’re in a conversation). Ask a new friend or acquaintance if they want to grab a slice of pizza. Read the bulletin boards to find out where the room parties are for your particular interest. Yes, it’s scary as hell. You and I both know that. But it’s worth it. You’re stretching, you’re growing, you’re having an honest-to-god adventure! And adventures are addictive; you’re going to want another one, so you’d better start saving. Now I’d love to hear about your own experiences. Got any advice for us introverts on how to have a good time at a convention? Please leave me your comments below! Right, extending your social circle through friends is a good idea. And offering a compliment to someone (on their fursuit, t-shirt, hair style, etc.) is a great way to push your shyness barrier. Yes, it can be scary (and I know that from experience), but furries are some of the friendliest people I know. Sometimes it’s best to find a conversation in progress, wait for an opening, and add your comment. All eyes will be on you, so you can introduce your character and your real self. If they see you again, they might say hello. That sounds like a good idea, Bally. I’ve done this myself.